Just a quick reality check for all of us here – how many of us carry more than two gadgets everywhere we go? iPhone owners need not laugh, you might have a phone and an iPod in a single device, but surely those are not enough to satisfy your lust for gadgets? Most of the time, one of the main issues folks struggle with would be making sure our devices are well juiced up to handle whatever tasks we throw at them without having them die on us. Well, apart from planning your travels carefully with frequent stops along places that offer power outlets, you will also need to do your part by charging your array of gizmos before the trip to make sure they’re good and ready to go at a moment’s notice. The iGo Charge Anywhere helps you out in your more tardy moments, where you will find this travel-friendly charger featuring an internal battery that will help charge your devices in any location, with or without an outlet. The iGo Charge Anywhere is compatible with just about any and every cellphone in the market, apart from handling the more popular handheld gaming consoles (the Nintendo DS, DSi and Sony PSP spring to mind here) with much aplomb. You can even juice up a couple of your favorite devices simultaneously while keeping it connected to a power outlet for the integrated battery to replenish itself. This charger doubles up as a wall charger whenever it is not fulfilling its role as a transportable outlet, making it one versatile device that every frequent traveler ought to consider if they don’t want to end up in an awkward situation in an unfamiliar place. 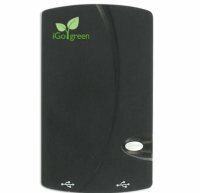 The iGo Charge Anywhere will retail for $49.99 and ought to be readily available. It is also highly portable, thanks to collapsible wall blades that easily fold away. It seems that the iGo Charge Anywhere is capable of holding enough juice to provide up to three full charges to most mobile devices. Any takers? This seems to be pretty cool, I would definitely use it when I had no place to charge my products. This is the best addition to the iPhone I have ever seen. It is small enough to hide in a pocket and has enough juce for 3 charges! I Love it! And I would not hesitate to purchase another one. As notorious as the iphone is for going dead, this is fantastic. No more looking for wall outlets to charge the phone. Mixed opinion. Bought the charger and a tip for my blackberry when I forgot to grab my charger while packing for a trip. Works great for the blackberry with the included usb cord and iGo tip. However, it won’t charge my iPod Classic or iPod Nano using the iPod provided usb cable. Apparently, even though the charger has usb ports, a proprietary cable or tip is required for it to work correctly. Great idea, poorly implemented.